Looking for an exciting new crossover the whole family will enjoy? 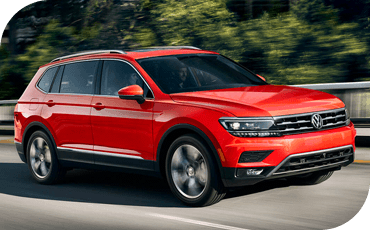 The 2018 Volkswagen Tiguan is definitely exciting! That's because it's available with all the features you're looking for in a modern family hauler, plus the impressive performance and drive that only Volkswagen engineering can provide. And it's priced just right. To show you what an amazing value the 2018 VW Tiguan truly is, we're comparing it to one of its most successful competitors: The 2018 Ford Escape. Not only is the Tiguan available with a third row of seats for extra flexibility, it's got so many features and other advantages that simply make it a better buy. Find out all about them below! Or, swing by for your test drive. The impressive balance, poise and control of the new 2018 VW Tiguan is something you'll only be able to truly experience from behind the wheel. The 2018 Ford Escape is a small crossover that seats up to five people, and so is the 2018 Volkswagen Tiguan — unless you want a third row in the VW. If you do, you can get a third row of seats perfect for extra passengers when you need them. That means you can fit up to seven people in the new Volkswagen Tiguan! Or, just fold them down when you need more cargo room. You also might find the stripped-down interior of the base Ford Escape a little too spartan. It lacks many of the basics you get standard on the 2018 Volkswagen Tiguan, such as illuminated vanity mirrors, driver's seat lumbar adjustment and automatic climate control. 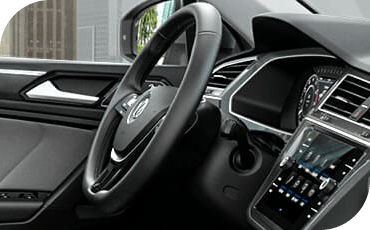 As a standard feature, every 2018 VW Tiguan gets Apple CarPlay™ and Android™ Auto! 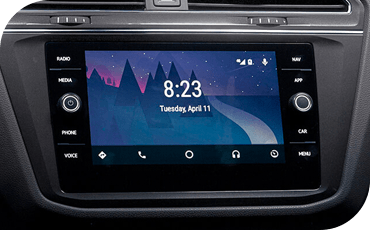 These technologies are superior to the Bluetooth-only smartphone connectivity you'll get on the base 2018 Ford Escape for audio streaming and hands-free texting. Better technology finds its way on the outside of the 2018 VW Tiguan too. It comes standard with heated, power exterior mirrors and LED daytime running lights for a striking look. The base Ford Escape provides halogen running lights and no heated mirrors. You'll have to pick from one of three available engine options on the 2018 Ford Escape — and the ones with more power will naturally cost you more. Or, you could opt for the 2018 VW Tiguan which provides just one engine ideal for every trim level. The base 2018 Ford Escape provides only 168 horsepower and 170 lb/ft of torque while the VW Tiguan gives you 184 horsepower and a whopping 221 lb/ft of torque! That means it'll give you quicker acceleration. 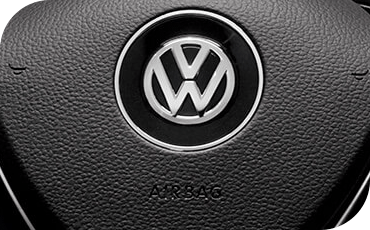 In crash tests carried out by the Insurance Institute for Highway Safety, the 2018 Volkswagen Tiguan outperformed the 2018 Ford Escape. Where the VW Tiguan earned the best-possible "good" rating in all tested areas, the 2018 Ford Escape received a slightly-worse "acceptable" rating in the driver side small overlap frontal crash test — and the worst-possible rating of "poor" in the passenger side version of that test! Better still, the 2018 VW Tiguan comes with America's best bumper-to-bumper warranty! Volkswagen stands behind their German engineering with an industry best 6-year/72,000-mile warranty, compared to the ordinary 3 year/36,000-mile bumper-to-bumper warranty that covers the Ford Escape. Thanks to advanced driver assistance features, you can be better protected from traffic changes you can't see or can't react to in time. Available features like blind spot monitor and lane keep assist will protect you on both these cars — but only the Volkswagen Tiguan is available with truly automatic pre-collision braking. The 2018 Ford Escape can alert you to an impending frontal crash, and even prime the brakes for maximum stopping power. But it can't stop itself automatically. 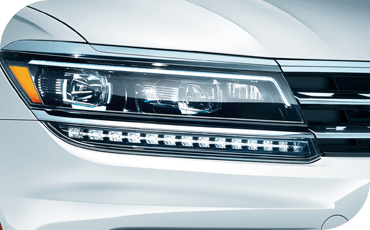 The 2018 VW Tiguan, however, can!